Review: Boys Cry / It's Just Movies Review: "Boys Cry"
Two teens slamming down pizza from their bottom rung jobs radiate their lust for life. Sprung from work and cruising home they hit and kill a pedestrian on a dark street. They did not see the victim, because he did not want to be seen. Terror stricken, they flee the scene, and a night of carefree teenage friendship, and dreams of a better tomorrow, vanish in their first act of crime. As Italy struggles under the threat of austerity and a better life disappears into a miasma of politics, what was once a distant whirlpool of gangland quicksand becomes the only home the boys have. The Film Society of Lincoln Center and Istituto Luce Cinecittà present this all-too-real drama as part of the 18th edition of Open Roads: New Italian Cinema. The feature debut of writing/directing team Damiano D’Innocenzo and Fabio D’Innocenzo, the film was a critical hit at the 2018 Berlin International Film Festival. As one would imagine, Manolo (Andrea Carpenzano) and Mirko (Matteo Olivetti) are traumatized by their panic-stricken hit and run. Bursting into Manolo’s living room they spew the news to his father who quickly cobbles together a cover-up. Believable enough, but the next day an entirely new story is born. The victim was on the run from the mob, and down-on-his-luck dad is overjoyed. The boys may be criminals, but they are as good as heroes to the mob and assured of an entre’ into a life of lucrative, if criminal, employment. 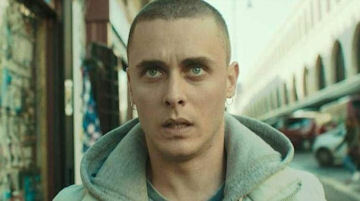 At first glance, two Italian teens embarking on a life of crime may seem like a knock-off of the indie tour-de-force “Gomorrah.” This movie has that look, a contribution of editor Marco Spoletini (who won the Donatello award for that work in 2009) and thanks to cinematographer Paolo Carnera, who did the lensing for the TV series of the same name. Better than that, despite a terribly gratuitous “God Father” mob dinner, this movie has a broader and more powerful intention. The single parents of the teens are living in tragic circumstances. They work hard enough but lack almost every vestige of even a middle-class existence. Teens turning to crime smacks of naiveté; adults turning their children to crime is true desperation. When Mirko’s mother and her new-found partner try to turn the boy around, it is too late. After their first mob assignment comes the godfather dinner where the viewer is given the real lowdown. These two are not destined to be Al Pacino’s “Godfather” Michael, but Joe Pesci’s “Goodfellas” Tommy. The lighting and perspective, starting with a mix of sunlit exterior and interior shots, darkens and become more claustrophobic. Not only do the crimes get worse, but the self-delusion becomes harder. The screenplay deftly shows the loss of the soul, step by step, as the lies become pitiful jokes to everyone but the doomed teens themselves. Their last assignment is a mob henchman who made the fatal mistake of thinking he could retire.